Get your bags packed and your road maps ready – the State Fair of Texas is just around the corner, bringing you an all-access pass to Texas-sized fun! A celebration of all things Texan, the State Fair of Texas encourages visitors to explore the great Lone Star State and all it has to offer. 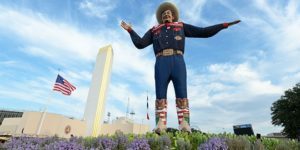 A combination of entertainment, art, agriculture, history and cuisine, the State Fair provides fairgoers with a unique way to experience every aspect of Texas culture, all in one place. With that in mind, the State Fair invites you to grab your family and friends and start planning your trip to the 2018 Fair. This year’s exposition will run Friday, September 28 through Sunday, October 21 at historic Fair Park in Dallas. Click here for livestock exhibitor information. This entry was posted on Wednesday, August 8th, 2018 at 8:22 am	and is filed under Events, News & Updates. You can follow any responses to this entry through the RSS 2.0 feed. Both comments and pings are currently closed.